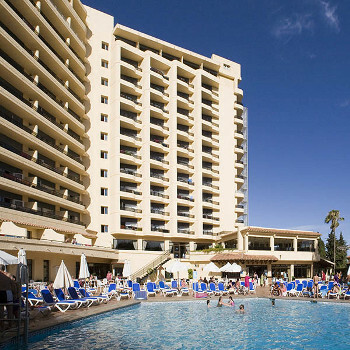 We visited the Gardenia park hotel for a week in may it isn’t in Fuengirola as listed but in Torreblanca but you can walk to the centre of Fuengirola in about 20 mins or get the bus right outside the hotel for 1 euro each. The rooms are a good size although they would probably be a bit cramped with 3 in, they do have some rooms with 2 adjoining rooms. The whole hotel was very clean, the pool area was washed down every morning and there are some lovely gardens with plenty of sunbeds. The entertainment team were very enthusiastic even though some of the entertainment was a bit dodgy!! The food was very similar to any other 3 star Spanish hotel that we have stayed in, plenty of salads breads etc and several main dishes although we weren’t over impressed with the snacks available in the AI package, it was basically bread meat and cheese or occasionally hotdogs if you were quick enough, not really enough to cover if you missed the main meal. The drinks measures were very generous but the bar service when we were there was dreadful sometimes you had to queue for 15 mins. There is a 2 drinks per person rule and when we were there some Spanish families arrived and just started going straight to the front, the bar staff knew but let them get away with it and served them anyway. I know the Spanish don’t usually queue but if they make all the other nationalities queue then so should they. There was only 2 barmen and they tended to serve you without speaking or even looking at you we have heard that there are now more staff so hopefully this shouldn’t be too bad now. While there we booked trips to Gibraltar and Morocco with a company called Flandiers next to Fuengirola bus station and both trips were very enjoyable. Overall a good clean 3 star hotel. We are 3 pensioners (men) and booked for 6 days in October 2011. We found the food not very good, too little choice of meats and only had potatoes once, the rest of the time it was chips, even on the Sunday. The hotel staff were pleasant, apart from a young man on reception, the hotel was quite clean, and room service was also quite good. The shop by the pool is to us, a complete waste of time, if you wanted a newspaper, you had to book it every day, hence no paper on the first day, and it was geared up for expensive and nasty souvenirs, water was dear there too, tip, if you want water, by the pool area there is a drinking fountain, fill your bottle there. for a quiet sunbathe,in fact everything was great and we`ell be back as soon as possible. The hotel itself was very clean, on arrival check in was quick, there are 3 lifts which seemed a bit slow. Rooms were basic, but cleaned every day with fresh towels if wanted. Food was never a problem and a great selection as was the drinks, possibly need to have more bar staff on as it did get very busy and queues were long. The entertainment team worked hard, but in the evening got a bit boring ie kids disco, bingo, then maybe a quiz, we did have a few outside entertainers and the Elvis tribute was great as was the dancing and singing girls, the usual parrot and reptile shows who obviously make their money from taking pictures of you with their animals/birds. Do go to Gibraltar its fab, but book with the hotel we did the Gibraltar dolphins and shopping and were taken to Gibraltar shown where the shops were and told to meet the rep later who then took us to the harbour, do the basic shopping and when you get there add the caves and dolphins on your own as Thomas Cook charged 22Euros more. we booked this hotel as they had addapted rooms as i am disabled, the room addaptions in the bathroom weren't very good there was no other disabled tiolets in the hotel so we had to go back to our room to use the tiolet. the lifts are very small and had problems fitting the wheeelchair in. the all inclusive was very good value for money, the food was average always found something to eat and the drink was very good. they let you order 4 drinks at a time which helped keep the queues down. the entertainment was average most of the time and on the odd occation it was very good.all the staff were all very helpfull. the only reason i would not use this hotel again is it's adaptions in the bathrooms are not that good and the fact there are no disable tiolets anywhere. We really enjoyed this hotel and feel it is a good value for money break. The meals overall were varied and I found them to be hot rather than having to use the micro to heat it up. There are a lot of nice littel touched such as good quality napkins, heated plates, choice of vinegar and dressing etc. The bedrooms were basic but clean and the beds were really comfy. The entertainment was quite good and the entertainment worked really hard to get everyone to enjoy themselves. The drinks were the locally brewed concotions but the mixers were a bit more palatable than other hotels i have been in. The good bit was being able to order 4 drinks at a time so could get a beer and a spirit for both of us. As well as the pool area for sun worshipping there are lovely gardens which were quieter and did not have the usual music blaring. The hotel location is good if you want a quiet break right on a lovely beach but it is a bit of a walk to Fuengirola to the hub of entertainment. The train station is only a 10 - 15minute walk and there is a bus stop right outside the hotel. We will definately be back to this hotel but i would imaging that it would be a bit of a nightmare during the busy season when the schools are off. It was good to know that the majority of people we spoke to have been at this hotel on several occasions which surely is the sign of a good deal. We have just returned after spending a week at this hotel. I would like to warn anybody who is thinking of renting a safe deposit box to be very careful as We had 60 euros stolen. I counted the money in the afternoon because we were going to Gibraltar the next day, and, in the evening when I went to get money there was 60 euros missing. When I reported it to the manager he said no one can access the safe without the code you put in and a member of our party must have taken it. I was the only person who knew the code and when speaking to another holidaymaker he told me how they can access the safe without your code, because it had happened to him in a different hotel, so please be careful. We will not be returning to this hotel. stayed for a weekend in winter food was ok but not great. ok for just a weekend. 13 nights here,over the Xmas and New Year. Gala meals excellent, the regular meals a bit repetitious but the free wine on tap makes up for that. Free to everybody, not just A/I. Good hotel and will be back next Xmas.